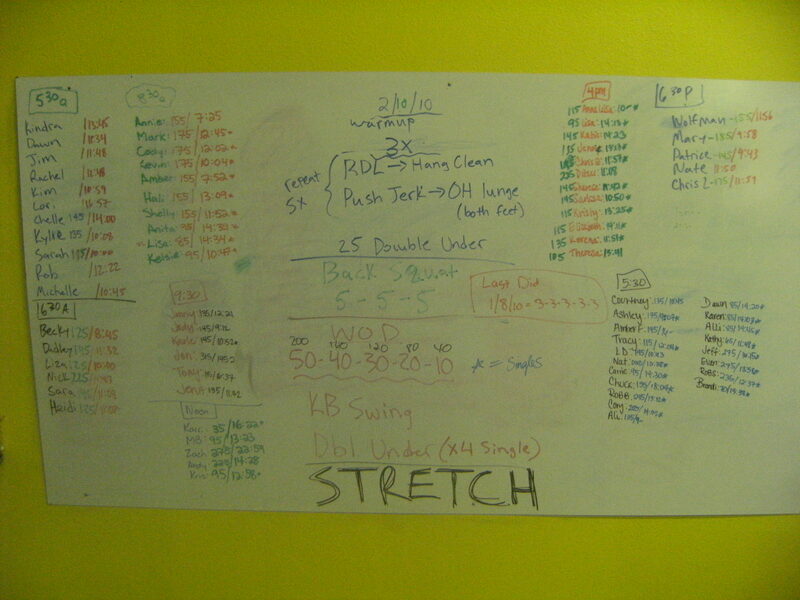 What Did Your Workouts Used Look Like? A bunch of us were talking after class one day about what their workouts “used to” consist of. When I started to think about it and look at my old notes I really noticed how far I have come with my fitness and personal gains. Tell us the difference that CrossFit has made not only in the gym with your physical benefits, but the results it has provided, the friends you have made and what you have learned about yourself. This entry was posted on February 10, 2010 at 3:44 pm and is filed under Crossfit Philosophy, Lifestyle, Members. You can follow any responses to this entry through the RSS 2.0 feed. You can leave a response, or trackback from your own site. -Upperbody exercises such as pullups, push press, bench, lateral pulldowns, curls. Looking back, I didn’t do nearly enough strength training, and especially not nearly enough leg and core work. I also did too much simple cardio and not nearly enough intensity. Looking back, I really didn’t do anything that was constantly varied or high-intensity other than the 1 mile sprint, and that really hurt me when I started up at Crossfit. I’ve really struggled with leg, back, and ab strength as well as flexibility. I’m much, much better at that now, but I never realized how much stronger I could be if every muscle in my body was strong. The best description for my past workouts…..routine! Community is the biggest change in my mind from previous experiences at other locations. The support structure at CFSF is keeping me accountable and I am reaching personal goals I didn’t realize were possible. Running……That’s it. Never any lifting. It was boring and I never got where I wanted to go. I was always afraid that if I lifted weights I would get bulky. That’s what I have been told for years, that girls with my body type would get bulky. Well, since CrossFit I have become stronger, leaner, and more toned. I lift more now than I ever imagined, I have never been this strong, and it’s the best feeling. The best part is that my pants are getting bigger!! Crossfit has given me a sense of belonging. It’s the greatest experience that I’ve had in a long time. Just like Mike says above, the community is the biggest influence in my life right now. The positivity that comes along with Crossfit is like nothing I have ever experienced. Keep up the great work everyone! Chris always used to call me the “Queen of Cardio” I would workout for about 3 hrs a day. I would always get at least 1 to 2 hours in the morning either on the bike, treadmill, stairmaster, elliptical. Then I would go take a class i.e. spinning, bootcamp, hiphop, step, aerobics, and then off to the weight room to lift my 8lb dumbells i went. I like most had a routine and I was stuck, The more cardio I would do it seemed the less results I would see, so I had to make a change. Chris and i used to workout on the beach (yes I know why did we move? ), he would always do pullups or ring dips and I would always tell him that I couldn’t do those types of workouts cuz my lower half was so heavy that it would hold me down! LOL…… I wouldn’t lift a lot in fear of having the infamous “thunder thighs’ well the joke was on me! I now can do several pullups (50 to be exact suckas), deadlift almost double my body weight, do most exercises prescribed and I have lost inches and gained strength! I like Nick, Mary, and Mike have loved the community that CFSF has built! We all rely on eachother now instead of always having to rely on ourselves!!! It is such a great feeling when you are having a bad day or things are not great and you see your fellow CrossFitters and just perk up! Thank you CrossFit for not only being my family but my inspiration to be better eachday! I play quite a bit of volleyball and “farm girl” type of lifting. Before starting CrossFit, I thought a volleyball tournament (up to 15+ games of good volleyball in a day) was quite a workout! Since joining CrossFit, I have even more energy, I’ve lost close to 26lbs, learned a “life change” that works pretty good for me without leaving me craving bad food as much, made alot of friends that help pick me up and dust me off when I have a bad mental day, and overall I’m alot more confident not to mention I feel GREAT! My first taste of CF (thanks, Ka-BOOM-sma!!) involved several pullups for the WOD…I was exhausted after just the warmups and didn’t know if I could make it through the WOD! I told myself that I couldn’t quit…I didn’t want to disappoint myself and I surely didn’t want to disappoint Mary (even though I know she wouldn’t be)…..and I didn’t quit until I finished. I finished the WOD and felt awesome about 15-30 min afterwards. Even after being extremely sore the next few days to the point of having to “drop land” on the couch and wondering “what the heck was I thinkin? !”, I still went back for more and haven’t regretted a single moment. How does one that plays so much volleyball and not sit around the house all day be so out of shape?! Where do I even begin on how CF has benefited me? CF is not only an addiction, it’s been a positive life change for me. Now, I’m a better volleyball player (of course, I have to stand yet another 6 inches back so I don’t hit them way out of bounds!) not to mention faster! It’s nothing for me to do CF a few hours before volleyball and have plenty of energy for both….I don’t know I could have said that 7 mths ago. I’ve improved my running…when I first started, I struggled to make it 400m without stopping but now I’m able to make 800m without stopping. I find myself using proper form when lifting things (yes…I do apply the techniques for everyday lifting too! ), I feel stronger both mentally and physically. The results are amazing if you are ready to put in the hard work! In 6 mths prior to CF, I was able to lose 20lbs and go down 2 pant sizes. Since joining CF, within 7 mths I have lost about 26lbs and gone down another 5 (almost 6 now!) pant sizes! I have learned to believe in myself more and have an even stronger determination to reach my goals because I believe it can happen now. I’ve learned how to balance fitness in with my busy schedule, no matter what. If I’m not doing CF, I’m at home doing a home workout now! I’m in alot better place mentally. I enjoy exercising again! I enjoy having myself back! And…I enjoy my CF family!!!!! Like most former athletes, I thought I was in pretty good shape….HA! Then I tried a CF WOD! I first starting working out and lifting weights when I was 16 yrs old when a friend of mine and I trained with our High School Football team. At that time I was athletic but very very TALL and skinny (like 6’3″ 160!!!) We learned how to perform Olympic lifts, box jumps, plyometrics, and perform it at high intensities. After 10 weeks I gained 12lbs of muscle!!! My self confidence and performance with my basketball team spoke for itself. That 10 weeks was one of my fondest memories of High School career. After High School I became a trainer at a GLOBO GYMMMM!!!! and got away from a lot of the athletic conditioning I fell in love with and got me the best results of my life. My workouts consisted of: chest/bi’s, back/’tri’s, Legs, no running (I hated it), bosu and swiss balls, yadi yadda ya…I was bored, bored…BORED! While training at the GLOBO GYM I did learn a lot and see every fitness discipline and program that was out there. 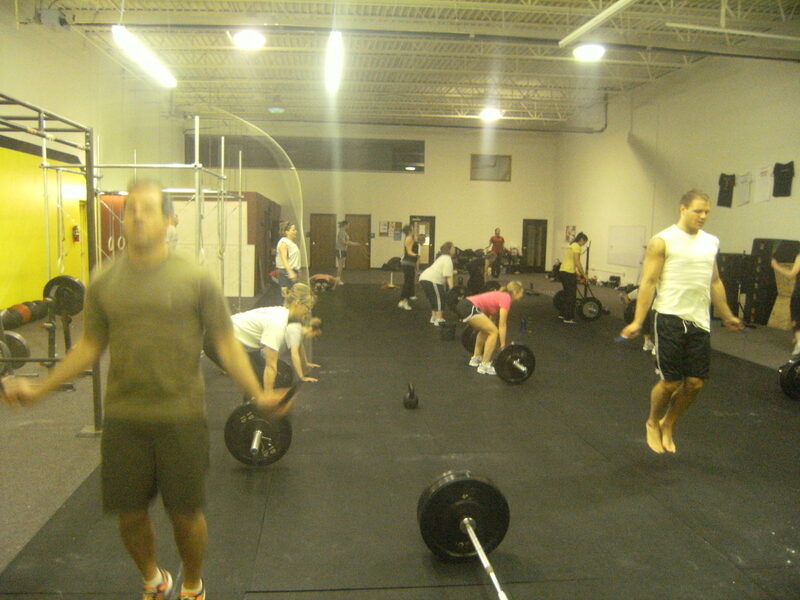 Then one day my brother showed me crossfit.com and the 1st thing I thought off was High School Football Training. Now training within the CrossFit model I am in the BEST overall shape I have ever been in. And it is only the beginning. CrossFit to me gives you the opportunity to always improve in anything and everything you do with NO LIMIT! The community it creates takes on a life of its own. Annie and I knew 3 people when we moved to SF in Oct 2008. We have quickly made friends that it feels like we have known for years. People that will do anything for you that you can trust and count on. We are so thankful for the move we made and the people we are so lucky to know. I can’t imagine where this thang is going to be in 3, 5, 10 YEARS!…Mindblowing!!! Where to begin… plan and simple… I was a gym rat. I put in around 12 hours a week doing 90% cardio with some light endurance lifting. I did the same schedule every week. Crazy and insane – yes. Effective – no. I was literally running myself into the ground. I have a very stressful job at times, and I would take all the stress from work out at the gym. I would literally run to my spinning bike and when I would sit down, I finally felt like I could relax for the day… and that peaceful moment lasted about 10 seconds before I biked as fast as my legs would go. My body did eventually crap out in April 2009. I ended up breaking my endocrine system and throwing myself into a complete mental and physical exhaustion. My resting heart rate went from the 60’s to 105. I could no longer walk up a flight upstairs without being completely out of breathe, my heart would POUND against my chest so hard that I could watch it, and I couldn’t remember ANYTHING! I lived in a brain fogged world where I would lean my shoulder against the walls at work and use it as support so I could walk to my desk and I would be so exhausted that I couldn’t even sit at my desk all day at work and would have to lay underneath it and try to refocus myself. Needless to say… I was broken and my life was literally falling apart. I went through so many doctors trying to get help. Finally my endocrinologist told me that my IGF-1 was extrememly low, well below the “normal” range, my blood sugar was low (all I wanted to eat ALL DAY LONG was SUGAR SUGAR SUGAR and it always knocked me back down when I crashed after eating it) and my cortisol was out of control. Being the pain I am to doctors, I knew what I needed to do, what my body kept telling me to do, and I refused ALL their medications and drugs and found help through acupuncture and finally was able to REST. My body needed to recover itself, and after months of living like this, I was finally starting to feel better in late August/early September and that’s when I started CrossFit. My Crossfit start was a rough one. My brain always wanted to do more than my recovering body could handle and after my 2nd WOD (I barely finished my first one with LD), I acquired “BELBOWS”. My arms were swollen like they were tree trunks and kept getting bigger and bigger until I finally had to go to the doctor (which totally freaked them out!) and had to get on meds to bring all the swelling down in my arms. After I was able to get back to CrossFit, I sprained my wrist my first day back (those dang thrusters!!) and that took forever to heal. Needless to say, even though I had some of my energy back… my body wasn’t quite as ready! My workouts before crossfit consisted of some jogging. I actually call it chugging because I go so slow 🙂 I joined several gyms for a few months and because I never saw results I quit… I THANKFULLY met Annie at Bunco one night and she told me about crossfit. I thought in my head “there’s no way I would be able to do that…” But thought I would give it a try. There is no way to describe the rush after finishing your first WOD, and from then on I knew this was the right fit for me. Crossfit has helped me lose 15 lbs, and I decreased my 5K race time by 5 minutes. I have muscles showing that I never knew existed!! The best thing about crossfit by far is the family aspect. Everyday I walk into the gym I feel like part of the family. I can’t thank you Annie enough for helping me realize exactly what I needed… And that was crossfit Sioux Falls. My former workouts (like Mike’s) are defined by one word–routine. M:Short run (3-6), T: Mid-long run (5-10), W: Short (3-6), R: Speed work (3-5); F: Mid-long (5-10), Sa: Long run (10-20). I was convinced that the only way for me to keep weight off was to run. The burden was not running, but the injuries that came with it. Shin splints, ITB syndrome, hip problems–from about 2005 on, I was always hurting. After Boston ’09, I started suffering terrible L knee pain. At the end of my 6 weeks of PT (and 1 large out-of-pocket), my PT said, “Rochelle, you will be able to run your whole life, but only if you do strength training. You have to get stronger.” Did I listen? No, I set out at 40-50 mpw training for the NYC marathon. One dreadful day in August, I walked FIVE MILES of a 15 mile long run–my L knee was completely jacked, it would lock up after a mere 200 yds. I was crushed. I knew I couldn’t afford another grand of PT, but what other activity could I do? One lonely Sunday night in early Sept, after a few weeks of only intermittent short runs, I texted one of my BFs in the whole world, Kimmy. I’d heard her rave about CF and tell me how much I’d love it. I asked if I could try it out, she texted Chris, and voila, I was there Monday morning, convinced it wouldn’t be good enough. And I wasn’t much more convinced after my first workout–I felt like my heart was going to pop out of my chest and I was going to throw up. Yes, ME, the girl who’d just a few months earlier, totally rocked the Newton Hills. I didn’t like not knowing the workouts and being able to mentally “map” them out the night before, as I used to map my runs. It was a total change from any workout I’d ever experienced. And now, I can’t imagine my life without it! CF has given me so much confidence not only in the gym, but outside the gym–in my ability to handle whatever life throws at me. Most important, CF has reassured me that the key to my happiness is surrounding myself with positive, happy people who live positive, happy lives. I used to push those people away and secretly pick apart their happiness. No more. The positive community aspect of CrossFit was something that was lacking not only in my workouts, but in my personal life, as well. I’m looking forward to running again this spring, but I’m going to focus on quality, not quantity. And I sure as heck won’t be giving up CF any time soon! Workout routine? Always “played” to get in shape! Countless hours in the gym just hoopin’ and shootin’….college found me getting tossed around, so I stayed out of the paint and lead the break :-)!!! Post college, I just ran and ran and ran and ran…thinking I can run 26.2 I am as fit as they get!!! Ha, my first CrossFit experience found me flat faced half way through the first round of burpees!!! As a medical professional I can greatly appreciate that CF hits all three pathways and is the most effective form of “fitness” where fitness=health, there is a huge difference!!! And thanks CF, for not letting me just “settle on waiting for the lottery pick” for holding me accountable, whether it is adding another 10 lbs to the bar or telling me to “stay in the game” or reminding me that its my “day off”….I need that/you!!! Work outs for me was trying to squeeze in a 2 mile jog with my dog, Max , add a few situps and pushups to keep me ready for the next PT test. Was short on time and energy, was working, drilling and home schooling and wearing thin. It all came to a crashing halt; literally with a fall off a ladder and several broken ribs. Was working on starting over when I lost my partner, Max. Was having a hard time motivating myself. In my “free” time would think about if there was 1 thing I wanted to do just for me what would it be. I decided when I was finished homeschooling that 1 thing would be to get back in a gym. I missed my military days of working out with my gym buddies. I worked 12 hours shifts then, lifting weights on my days off and running on the days I worked. Mostly I missed the commraderie. Being the program manager for my guard unit’s PT program, I was also getting worried about not doing well on my own PT test; not acceptable by my own standards let alone the military’s. I was trying to decide where to go, talking to my sister who had seen CFSF featured on the news; she told me enough that I knew CF was exactly what I was looking for, never checked anything else out. I’ve been at CFSF ever since, love the changes my body has gone through, am so much more toned, have lost weight, feel great about the way I look, and my only concern about my PT test is not MAXING it out. Mostly love the commraderie…exactly what I was looking for! I salute you Annie and Chris; am so glad you chose SF!